Illuminated Surface: 26 x 24.5"
The Velvet Light 2x2 Power Spot Bi-Color LED Panel without Yoke from VELVETlight is a light source with an expansive 2700 to 6500K variable color range and a high CRI/TLCI rating of 95, indicating an accurate rendering of color. Light intensity is also variable from 0-100% with flicker-free performance. You can make these adjustments locally on the fixture or remotely with a console via onboard DMX. The sturdy aluminum fixture has a compact form factor with an illuminated surface measuring 26 x 24.5" and has negligible generated heat, making it a wise choice for placement in tight spaces or for use close up to the talent without causing discomfort. This listing is for the 2x2 only. The light requires the purchase of a 90 to 264 VAC power supply or battery plate for use. 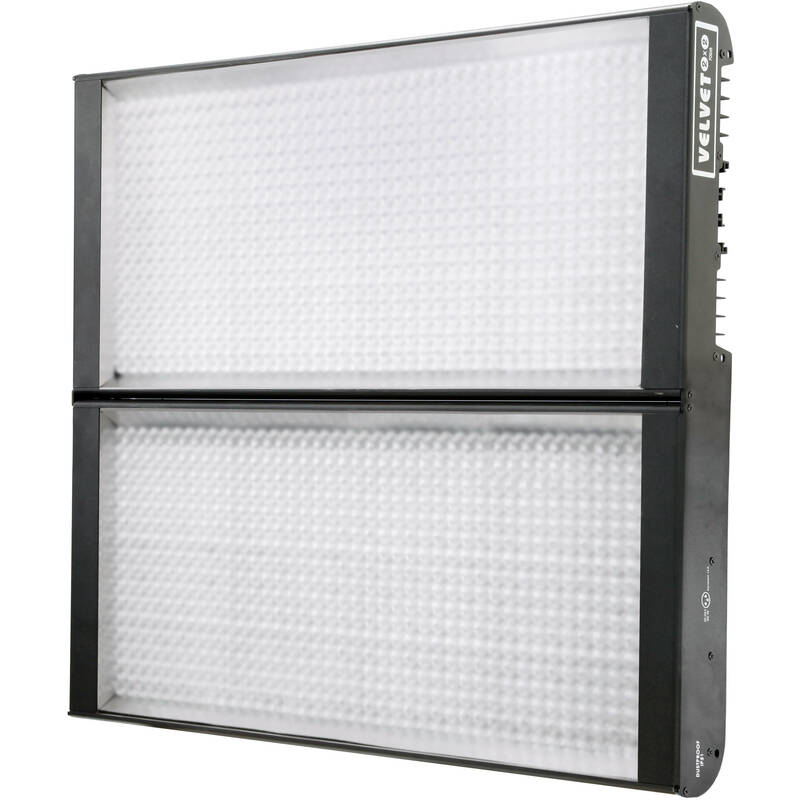 Slim, compact, and easily hidden in tight locations or on low ceiling sets, the panel is quick to rig up or handhold. It features a quickly removable yoke with a 5/8" baby receiver combined with a 1 1/8" Junior pin and sliding 1/4"-20 threads for rigging located on panel sides. With the Velvet Light 2x2 there is no need to use correction gels or replace diffusers to vary color temperature and light intensity. The soft beam produces open shadows and is easy on the talent's eyes. Soft, wraparound light quality for simple beauty shots and natural portraits. The efficient Velvet Light Power 2×2's 15-degree beam angle delivers 25000 lux / 2300 fc from just 340W of power - enough to replace a 5K Fresnel. The panel is ready for worldwide use using the optional 90 to 264 VAC power supply. It can also run on optional batteries when mains power is unavailable.